Without light there is no colour and light is the source of all life. It is the reflection of light rays which comprise the colour spectrum. Everything is measured in wavelengths and each colour has its own wavelength too. Angela Wright aptly explains it as these wavelengths consist of photons, or atmospheric particles of energy which, when they strike an object, will be absorded or reflected, depending on the pigments that the object contains. A coloured object absorbs only the wavelengths which exactly match its own atomic structure, and reflect the rest – which is what we see. What is the Colour Spectrum? What are Primary Pigment Colours? 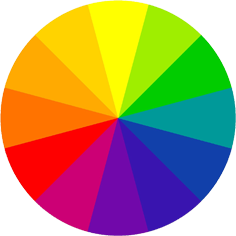 This comprises 12 pure colours of the colour spectrum. The spectrum is achieved by sending white light rays through a glass prism. Like the formation of a rainbow drops of water in the sky which act as millions of tiny prisms. Red and yellow are warm colours and are inclined to move forward and make a room seem smaller and cosier. The deeper, brighter or darker the tone, the stronger it will stand out. The paler the tone, the larger the room will appear. Lime-green contains yellow and has a warm colour. Purple (blend of blue + red) can be warm or cool, depending on it’s co-ordinated colours. Use cool colours in a warm room north facing and warm colours in a cold room south facing. Use of harmonising colours a tranquil environment will be your result. Use of contrasting colours a stimulating and dynamic space. When ceiling is too high paint the ceiling and cornices in a warmer or darker hue than the walls. Use the 70% 20% 10% theory.